Even the tiniest kitchen is arguably the core of any home. It’s where we start our mornings by the coffee machine and end our nights hosting friends. So it’s totally understandable that the kitchen may just be the most intimidating room in any house to decorate—you’re going to be spending a lot of time in it, so you better get it just right. When it comes to adding personality, the best way to do so is via kitchen wall colors. There’s a lot to be said about the colors we choose to adorn our walls with. Some believe in color theory, or the idea of choosing certain hues to fulfill specific purposes. For example, you may have heard tips like opting for red in a dining room to increase appetite or trying blue walls to create a calming space. While the science of this philosophy is divisive, the crux of it—that color, specifically the colors we paint our homes and choose to surround ourselves with, is a deeply personal choice—is not. A fresh coat of paint is the easiest way to personalize a space, after all. This is a sentiment echoed by Bachelorette star–turned–Sherwin-Williams color designer JoJo Fletcher: “Paint is honestly one of my most favorite ways to change up the design of a home; to me, it’s the easiest way to really give more depth and personality to your home,” she told us in an interview. And with the kitchen, there are endless options for customization. Most kitchen walls are predominantly covered by cabinets, so giving wooden cabinet fronts a new coat of color is a super-easy way to create an entirely new vibe. You can paint the trim on the doors or windows for a unique look. Or you can go the classic route and give the walls a brand-new color to create what looks like an entirely different room—no costly renovation necessary. However you want to paint your kitchen walls, we have some ideas. Whether you’re looking to make a statement with a dark tone or want to settle on a softer hue, these are the kitchen wall colors worth your consideration. Parisians do it best when it comes to cool, moody decor. This antique-filled Paris apartment is all about old-school charm, where vintage pieces emphasize the home’s beautiful architectural features. In the kitchen, this means offsetting darker cabinets with a muted blue-gray. If your space has deeper-toned cabinetry, opting for a lighter shade like this creates interesting visual contrast. When in doubt, match your cabinet colors to the kitchen wall colors. In this UK kitchen, a deep green shared by the backdrop and cabinets creates unity and makes the cabinets look built-in, which, in turn, creates the look of a custom-built kitchen. It’s all about visual trickery and looking for ways to make your space look a lot more expensive than it actually is. Haven’t you heard? Black kitchens are the new white kitchens. With matte black tones ruling the color trends for a couple of years now, you can’t go wrong with dipping your toe into this style. Go all-out with the dramatics and paint your kitchen in a true black shade—look for one without cool or warm undertones. This kitchen, created by A.S.Helsingö, is a great example to follow. This Mediterranean-inspired kitchen is all sorts of calming, and a good chunk of that effect can be pegged to the clean, simple wall color. Look for a white with cool undertones to keep your kitchen from feeling too sterile. Then, play off the simplicity of the backdrop by layering in rustic details like a linen dish towel and an assortment of ceramics. If a more lived-in feel is what you’re after, look for a cream-hued paint. Whitney Leigh Morris is an expert in making a tiny home feel perfectly curated, and in her kitchen, that starts with a warm neutral base that’s versatile enough to work in the rest of her open-floor home. The off-white makes the kitchen feel light and airy. And as anyone who has ever dealt with a small kitchen will tell you, that is an important feeling to accomplish. Maybe you’re willing to go a little—okay, just a smidge—bolder in your neutral color. In that case, Benjamin Moore’s pick for the 2019 color of the year is perfect: Metropolitan is a calming gray hue that will add a bit more edge than plain white but won’t feel overwhelming on your kitchen walls. “It’s a much more complex sort of gray,” explained Andrea Mango, the brand’s color and design expert. “It’s really looking to the characteristics of the color and how it can be enhanced by natural light.” This English kitchen features a strikingly similar hue on the cabinets and it certainly does highlight the natural light streaming in through the windows. As far as kitchen wall colors go, vibrant coral is definitely a daring one, but this tiny NYC kitchen pulls it off with such ease, there’s hope for anyone attempting the bold hue. Pantone’s pick for 2019 color of the year, Living Coral, is prime for maximalists. And if you’ve gone as far as to dress up your kitchen’s walls with a similar shade, you may as well go all-out: Try your hand at color-blocking, setting the coral tone against an equally vivid citron yellow in the tile or accessories for some fun contrast. HGTV Home by Sherwin-William’s pick for the year’s trendiest color is Reflecting Pool, a summery shade of turquoise. This wall color would look great with wooden accents to play up the natural vibe; try an accent wall in your kitchen or maybe a painted backsplash to bring the color home in a manageable way. Martyn Thompsons’ New York apartment is fully decked out in this inky blue hue that’s reminiscent of Behr’s pick for 2019 color of the year, Blueprint. It works well as a kitchen wall color, where the darkness of the paint is offset by lighter cabinetry and complemented by kitchen accessories in varying blue tones. Bonus points if, when you try this color out in your own space, you get your counters to match the rich hue of the walls. Given the pervasiveness of desert style in the design world right now, we’d say you can’t go wrong by picking an earthy terra-cotta hue as your kitchen wall color. It’s no wonder Sherwin-Williams predicted a similar shade would be the most popular color of the year. We love Justina Blakeney’s orange-toned kitchen. Lean into the boho aesthetic with this statement-making color and accessorize your space with plenty of plants and fun prints. 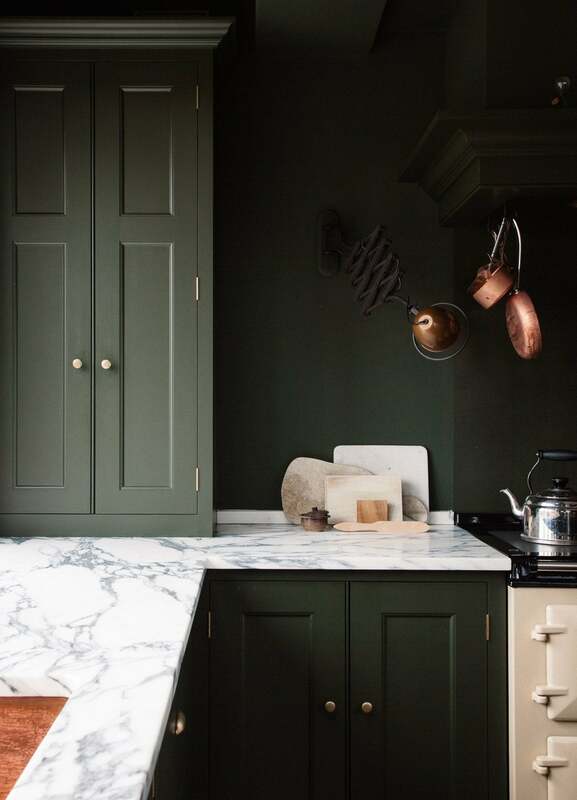 As Devol Kitchens notes of this space, the rich green color perfectly accents the brass accessories—this color combo is definitely one of the more contemporary ideas we’ve seen for kitchens. It’s no wonder PPG Paints chose emerald as its 2019 trending color. The shade is both timeless and trendy; the choice to go in either direction is entirely yours, depending on how you accessorize your newly green kitchen. Pick sleek, bronze accents for a modern look or go for distressed woods and layered textures for a more classic, lived-in style. Minimalism has never looked bolder. This kitchen belongs to a cool Australian home full of unexpected moments; vibrant Kelly green–painted cabinets set against stainless steel cabinets and backsplash is just one example. Fully enhance the mod vibes by eschewing cabinet hardware altogether. With nothing left to detract from your bold paint choice, the cabinets—or whatever you choose to paint green—will undoubtedly be the star of your kitchen. Another example where floor-to-ceiling paint may not be the best way to bring color to your kitchen walls. This custom-built kitchen by Burns Architects features an interesting way to bring in bold color without going overboard. Try painting only select wall cabinets a bright red, leaving the rest bare, for an eclectic yet modern look that feels unique. Accent the saturated hue with red accents, like light bulb pendant fixtures. Bright yellow-orange is definitely an unexpected color for your kitchen. If you’re not fully sold on the hue but want to try something a little daring, start out with an accent wall; if you have an open concept kitchen-dining room, christening the wall by the dining area the “statement wall” will help create the feeling of two separate and distinct spaces. When picking your orangey tint, look for something with golden undertones to make it more palatable. This teal kitchen belongs to an uber-cool Berlin home and is a lesson in monochrome design. Go for the full trifecta of bold kitchen walls, cabinets, and counters. Not only does this tie the room together, but it’s the easiest way to really pack a punch with color without making a huge effort—all you really have to do is settle on a shade of paint. Teal is a great choice for the contemporary decorator. Maybe you have an awkward kitchen layout that makes giving your walls a fresh coat of paint difficult; no matter, turn your attention to the wall’s cabinets. Especially when set against a simple whitewashed backdrop, bright yellow really pops. It’ll bring a burst of sunshine into your kitchen despite what the weather forecast says. Plus, if you’re spending so much time in one particular room, why not make the color in it a happy one? Ice cream pastels have been one of the most ubiquitous color combinations in design over this last year, and it doesn’t look like the palette is going anywhere anytime soon. Try your hand at the trend with a sugary pink kitchen wall hue. This English country home is anything but stuffy and traditional—as exhibited by its fun kitchen, which sees a Millennial Pink wall color paired with funky graphic tiles and glossy teal cabinetry. Take a page from this space and keep your own kitchen from feeling too sweet by infusing it with some unexpectedly modern details of your own. The pale blue color on the walls is made that much more visible by the fact that it’s complemented in the tile backsplash; take a similar approach with your own pastel-hued kitchen and mix in tones of the color of your choice to create a layered look. Here, the light blue is even reflected in the light fixture. It’s all in the details. This is how Scandinavian designers do pastels. While the walls in this Polish apartment are covered in white tile, the color that comes in from the cabinetry steals the show. The fresh, pale turquoise hue is contemporary, rather than juvenile, thanks to the simple hardware and clean lines of the geometric shapes in this room. Take a page from Scandi style when implementing pastel hues in your own kitchen and stick to simple silhouettes and modern furnishings to create a similar vibe. Pistachio green is definitely an unexpected kitchen color, but it’s one we can’t get enough of. This LA home sought to incorporate the sunny style of Southern California, pairing the pastel cabinetry with retro appliances and fun light fixtures. When using this paint color in your own kitchen, think of the pale green as an almost neutral base and go ham on colorful accessories to turn your room into a technicolor, vibrant space.